For anyone who has an Instagram account (I assume you do if you are reading this), you will know what a phenomenon it is. We contribute to a platform with over 600 million active users globally. In this day and age, I imagine it’s a challenge not to be on social media. Somehow it has become a big part of my life both for personal use, Decisive Cravings, and my work. Facebook is great for staying in touch with friends, Twitter is where I go for more mainstream news, Pinterest is a fantastic resource for images and research, but Instagram has to be my all-time favourite. More brands and influencers seem to be using it, and it allows everyone (famous or not) to share their lives in a thoughtful way. Although at times it can be a little too curated, it is inspiring and it’s amazing to see how the standard has been lifted. For a platform that was intended to be ‘instant’ I know it’s far from that, but I love it all the same. I am always on the hunt for new accounts to add to my ‘following’ list but I do have some staple accounts that always deliver and I wanted to share some of them with you. As I come across must follow accounts (not all the people I follow post regularly but when they do it’s often worth the wait), I will add them here. 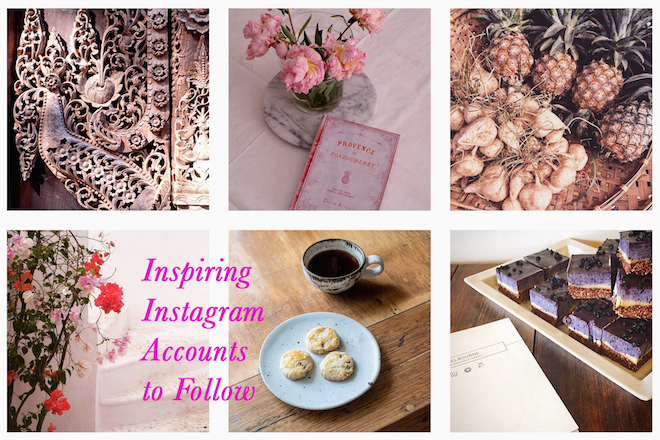 Which are your favourite Instagram accounts to follow? @mimithor – This has to be one of my favourite accounts to follow. 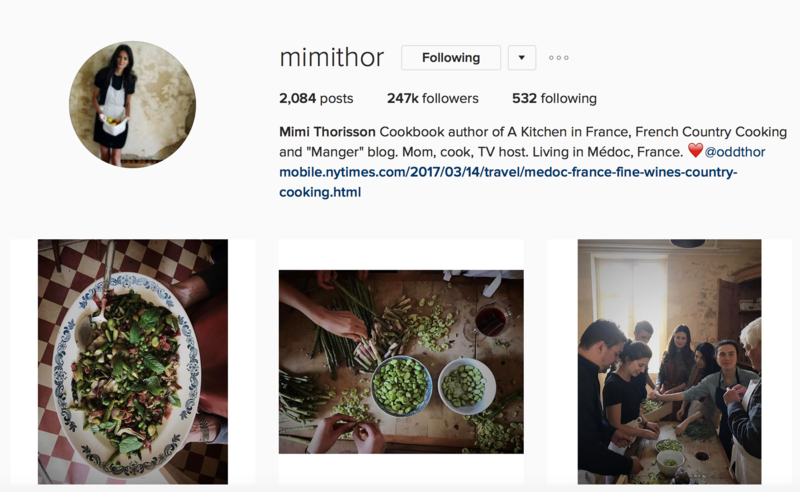 Mimi has a blog, two books, and her Instagram is a delicious feed (taken by her photographer husband) of her cooking and charmed life with her family and their dogs in Medoc, France. @juliaostro – Julia is Melbourne based home cook who is constantly creating delicious comfort food (think pastas, sourdough loaves, beautiful cakes). She is soon to launch her very first book chronicling all her amazing recipes. @skye_mcalpine – Enjoy these glimpses of a colourful life living in Venice. Skye’s images are more like art, beautifully curated and always featuring stunning produce, props and flowers. @emikodavies – An Australian living in Florence, Emiko is a food writer, cookbook author and an amazing photographer. She is constantly cooking the most drool-worthy regional Italian dishes and taking beautiful photos from her kitchen. 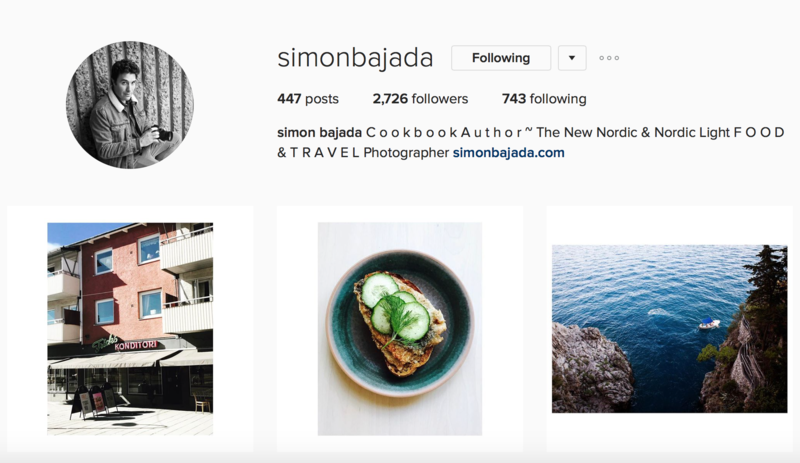 @simonbajada – This cookbook author’s feed is stunning. All the shots are professional and editorially styled with great use of light. @localmilk – Beth’s account is probably an obvious choice but I couldn’t not include her. I am sure there are hundreds if not thousands of accounts that try to emulate her style. Every image is absolutely flawless, perfectly framed, with an amazing use of light, and always with a special detail or theme to consider. @boxofspice – I love the colourful, exotic and moody visuals of Rakhee’s account. A lot of accounts go for this ‘look’ but there is always something that makes her images look new, unique and original. @lesfillesdemadeleine – Stunning, light filled, detail-full food photography. Elise’s images look so simple and effortless but I can only imagine the thought and work that go into creating each one. @elodbelle – I love Elodie’s account and am sure people will be following her in flocks very soon. A food photographer and stylist, she has a beautiful way of styling her images and an interesting way of playing with light. @luisabrimble – Luisa’s account is stunning. One look at her feed and you’ll be pressing ‘follow’. @davidprior – David is a young but incredibly accomplished writer. He also has a fantastic eye which can be seen straight away when you look at his feed chronicling beautiful details from his stories and travels. @renee_kemps – Renee’s pictures jump between food, interiors, and travel. They are minimal in style, stunning and always beautifully framed. @jackiecole – I came across Jackie’s account only recently but instantly fell in love with her style. Expect lots of photos of landscapes, interiors, outdoors details and the odd cactus. @matildegattoni – Matilde’s photography work is incredible. She captures incredibly raw portraits of people’s daily lives, their thoughts and expressions. @lisacohenphoto – Lisa’s work is flawless and her account is essentially a feed of stunning editorial-style photos. Think interiors, restaurants and the occasional landscape shot all taken in the most perfect light. @leanntimms – Beautiful, minimalist captures of life and light. This is a stunning feed for people that love interiors, natural landscapes and the occasional food shot. 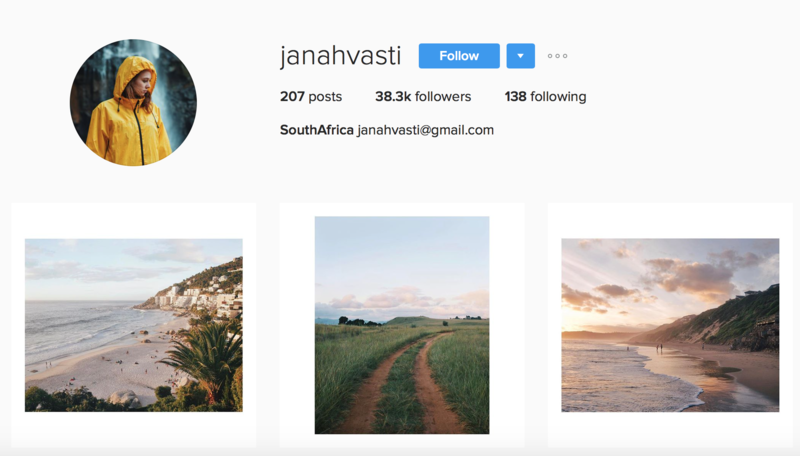 @janahvasti – Gorgeous landscape photography shots that are full of faded colour and light. @masseriapotenti – A quick look at this feed and you’ll want to be booking in to Masseria Potenti. Their account shows beautiful details of daily life at this stunning property. @nicole_franzen – Another beautiful account full of details. Whether it’s a building, restaurant, plate of food or a designer interior, Nicole gets it every time. More accounts to be added soon!